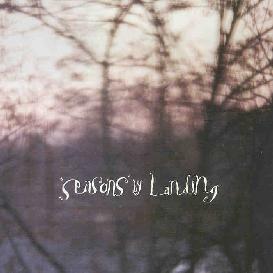 Fans of Landing's previous release, Oceanless, may be a little surprised by their new CD, Seasons. But it will come as no surprise to those who know that Oceanless was recorded several years ago. Chronologically, this is more of a follow-up to their debut, Circuit, and is more in the avant-pop tone of that work. The members of Landing excel at creating rich, haunting soundscapes, and while they continue that theme on this new album, there is also more of a focus on writing songs, with clearer vocals, and gentle acoustic finger picking, and less of an emphasis on the noisy washes that have given a sharper tonal edge to previous albums. When I interviewed them earlier this year, prior to this release, they referred to Seasons as their "pop album". If that's the case, then this is supremely laidback, pastoral "space pop". Just take a listen to the lulling acoustic folkiness of Encircled (Through Fallen Leaves), as it dissolves into a dreamy landscape of gentle electric guitars and magical, flowing synth, or Can't Hide Forever (Into the Woods), which melts from melodic lushness and beautiful wordless male and female vocals to a chilling, Krautrock-like exploration. The album follows a cycle, as its title suggests, through the four seasons, starting with the bright harmonics of Fall Sky (which conjure up the image of red and gold leaves swirling through pale autumn sunshine) and ending with the upbeat, free and easy romp of Blue Sky Away. While each of the songs creates its own mood to fit whichever season it's representing, this ends up being an album that can fill a space in time year round. Something to listen to on a peaceful day regardless of what season it is. Just sit back in your most comfortable chair and let the music flow into you. For more information you can visit the Landing web site at: http://www.landingsite.net/. Contact via snail mail c/o Ben Goldberg; Ba Da Bing; PO Box 204; Leonia, NJ 07605.